For more than 25 years, aviation and aerospace have been important parts of our firm’s litigation practice, as the firm’s founder and key members of its management have obtained extensive training in engineering and flying in addition to the practice of law. Godfrey | Johnson, P.C. a has represented a wide array of clients from many different quadrants of the aerospace industry, including aircraft and component part manufacturers, airports, air crash victims, avionics suppliers and aviation maintenance facilities. We’ve investigated and litigated crashes of small planes, helicopters and airliners from Antarctica to Alaska. Risk management and contractual structures in the aerospace world, as well as aviation insurance issues are well known to us, as we have litigated many issues revolving around these subjects. The aerospace industry is unlike any other. Many specialized functions and standards interlace in a fashion that has no true parallel in any other field, with the exception of the medical field. Whether a matter involves state of the art materials or the nuances of complex regulatory compliance, we can provide legal support integrating our advanced scientific training with the best legal thinking available. The attorneys at Godfrey | Johnson, P.C. include engineers with degrees in mechanical and chemical engineering. Two of our top trial attorneys are both pilots with thousands of hours of logged flying time, degreed engineers Air Force officers. Brett Godfrey has represented pilots, airports, FBOs, skydiving facilities, manufacturers and accident victims. He also has logged over 2,000 skydives. Lawyers who lack this unique experience are not equipped to compete with Godfrey | Johnson, P.C. in any dispute involving these specialized areas of knowledge. Paul Rupprecth is a former Lead Launch Engineer at Lockheed and a former instructor pilot for both United Airlines and the U.S. Air Force. Brett and Paul have significant experience working together as a team in high-stakes jury trials. Because the aerospace and aviation industries are so specialized, litigation in these fields requires not only extensive legal experience, but also a deep understanding of both aviation and engineering. You require lawyers with this unique blend of experience. Lawyers without our experience are at a significant disadvantage in this area of litigation. The attorneys at Godfrey | Johnson, P.C. possess this blend of skill and experience at a depth not easily found anywhere else. In this area, our aviation and trial experience work together with our in depth knowledge of insurance law. We have analyzed insurance coverage issues related to FBOs, commercial (Part 135) operations, personal aircraft, skydiving operations and large commercial airports. The key to success in litigation is to be realistic and careful in terms of how a “win” is defined under the circumstances of any given dispute. No two cases are exactly alike. Remember that no attorney or firm can guarantee success according to any arbitrary standard or in terms of a favorable result at trial. Whether or not to try a case or settle a case is a decision a client makes with the advise of an attorney, and no attorney can guarantee anything about the outcome of a civil case. Any case, tried to a jury or a court, might be resolved unfavorably. Trials are inherently unpredictable. 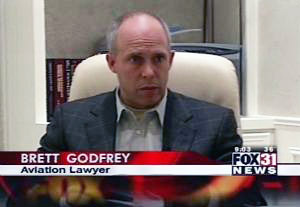 Statements contained on this website regarding the ability of the professionals at Godfrey | Johnson, P.C., are based upon good faith perceptions of our abilities demonstrated over years of practice, and are not intended to imply that the attorneys have never lost a case or that we can assure that any particular case will be won at trial or on motions. The best way to evaluate any case is to communicate about it in depth with qualified legal counsel, providing all relevant information to the attorney. It is dangerous to withhold facts from an attorney, and can lead to the delivery of legal advise that is fundamentally flawed. No attorney can prevent this from happening, as attorneys all must rely to some extent upon the information that is provided to them by their clients. The best way to evaluate an attorney is by that attorney’s track record, and ours is open for discussion in any specific field. Our abilities as described on this website are based upon experience in actual cases, which have been successful more often than not. ©2015 Godfrey | Johnson, P.C. All rights reserved. 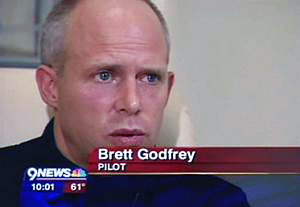 Brett Godfrey is a frequent guest commentator on television programs relating to aviation disasters.